FAQ: I have heard it said that the Day of Pentecost (in Acts 2:1 and following) was the “birthday of the Church”? The Greek word for “church” is ekklesia, and in Scripture it simply means a group of people called out for a purpose. In its 79 uses in the epistles written to Christians, it refers either to individual groups of Christian believers or to all Christians as a body. When we in The Living Truth Fellowship refer to the latter group in our writings, we choose to capitalize it as a proper noun. 1 Corinthians 10:32 lists the only three kinds of people in history, biblically speaking, and distinguishes this group of people from the other two groups: “Give none offence, neither to the Jews, nor to the Gentiles, nor to the church of God” (KJV). That verse makes it clear that no one was “saved” by being born again of incorruptible seed (1 Pet. 1:23 – KJV), that is, becoming a “Christian,” prior to the resurrection and subsequent ascension of Jesus Christ. Salvation has always been available ever since Adam’s sin necessitated it, but never until after Christ’s life, death, resurrection, and exaltation as “Lord” (Acts 2:37) did salvation consist of being “born again” of God’s spirit, receiving His “divine nature” (2 Pet. 1:4) and being “…sealed with that holy Spirit of promise” (Eph. 1:13 – KJV). (4) All of them were filled with the Holy Spirit [more accurately: “filled with holy spirit”] and began to speak in other tongues as the Spirit enabled them. It is clear that everyone who calls on the name of the Lord by confessing Jesus as Lord and believing that God raised him from the dead joins the ekklesia of those born again of God’s incorruptible seed and filled with the gift of holy spirit. It is also clear that the Day of Pentecost in Acts 2 was the first time this happened. 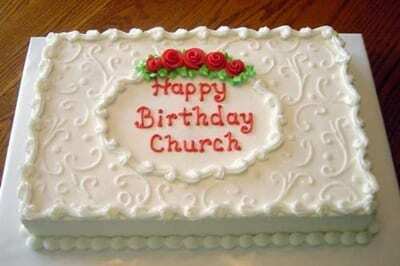 As such, it is the “birthday” of the Church, that is, its beginning. So what was “Pentecost,” when the birthday of the Church took place? In the Old Testament, Pentecost was one of the major Jewish feasts that occurred annually as per God’s directive for His people. These holidays were designed to keep God in people’s minds and to promote national unity. Pentecost was also called the “Feast of Weeks,” the “Feast of Harvest,” or the “Feast of Firstfruits,” and was held on the 50th day after Passover. What a perfect day God chose to bring in the “first fruits” of the Church, the eventually global Body of holy spirit-filled believers who would sow the good seed of His Word throughout the world. And, unknown to anyone until later in the Acts period when the Lord Jesus revealed the Sacred Secret to the Apostle Paul, the whole Church itself now enjoys in our “earthen vessel” bodies the same “first fruits” of the gift of holy spirit that all resurrected Jewish believers will one day have in their new bodies in the Millennial Kingdom.